Thank you for the valuable information that you provide for us residents of SF. 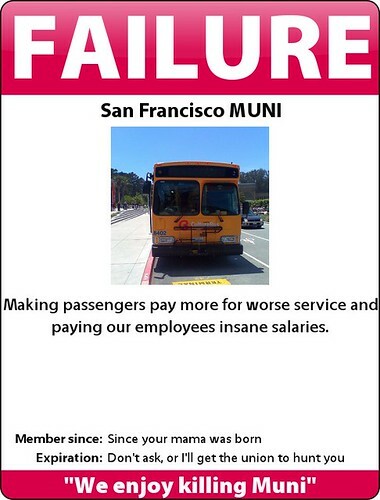 I was revisiting your blog this afternoon to share some frustrations about Muni and saw this post. You hit the nail right on the head and accurately represent my opinions. I don't have the time or space to detail the increase in incidents that have been happening on my daily L train commute from the Avenues to Powell. I will make a long story short and let you know that after 8 yrs of riding MUNI underground every work day, I am no longer doing it and now take the 23 to Glen Park and Bart in. It is so much less of a hassle and BART's efficiency really only makes MUNI's inefficiencies that much more apparent. It really does have a dramatic effect on your life, not having MUNI representatives yelling at you (literally) after being kicked off multiple trains at rush hour (or whatever the problem of the hour is), all while demanding higher pay. So thank you again for the information and though I am not fully informed on MUNI contract negotiations, I do sometimes wish they would strike, to make the people of SF realize they aren't so dependent on MUNI. There are other commute options and even if they take 5-10 minutes longer, it is sure worth not dealing with MUNI's non-existent customer service.